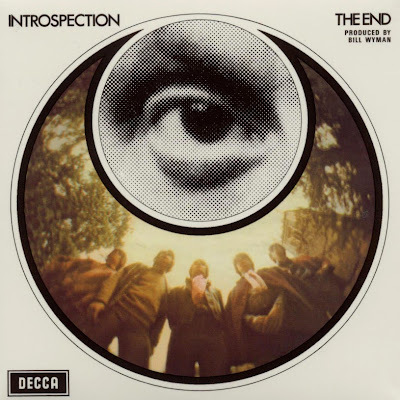 Managed by Rolling Stone, Bill Wyman, both Charlie Watts and Nicky Hopkins played on a track a piece on the Introspection album, which is very much a product of the psychedelic late sixties and is good. Dreamworld and Don't Take Me have sleepy harmonies, and other tracks like What Does It Feel Like? have some nice organ work. However, success eluded them and they eventually evolved into Tucky Buzzard who made three albums produced by Bill Wyman in the 1970's. Dave Brown and Colin Griffin formed The End in 1965 following the demise of The Innocents. Nicky Graham and John Horton were drafted in from Dickie Pride's backing group The Original Topics, and the line-up completed by former Tuxedos drummer Roger Groom. They set about recording at R.G. Jones' Morden studio, and Bill Wyman arranged for them to tour with The Rolling Stones to coincide with their first 45. They also appeared with Spencer Davis on ITV's 'Thank Your Lucky Stars' playing Hallelujah I Love Her So. Following the tour Roger Groom quit, to be replaced by Hugh Attwooll, a former schoolfriend of Nicky Graham. John Horton also quit although the split was amicable and he helped out on their second single Shades Of Orange. Cut by Bill Wyman during the sessions for The Rolling Stones' Their Satanic Majesties Request album, the song, has an almost hypnotic, dreamlike quality, and featured Charlie Watts on tabla. Following the release of Shades Of Orange, Gordon Smith too called it a day, and was replaced by former Mode guitarist Terry Taylor. This signalled a change in musical emphasis, more towards the style of their Introspection album, release of which was delayed for over a year, due to fallout from the 'Stones bust-up with Allen Klein. The band decamped to Spain, where several singles were released domestically, including Why, with which they scored a Top Five hit in April 1967. By Christmas 1968, both Colin Giffin and Hugh Attwooll had left, and although a new drummer, Paul Francis, was enlisted the writing was on the wall... and with the arrival of another Mode refugee Jim Henderson, they metamorphosed into Tucky Buzzard.